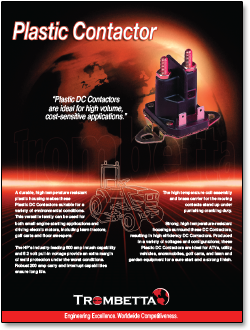 Strong, high temperature-resistant housings surround Trombetta's Plastic DC contactors, resulting in high efficiency. 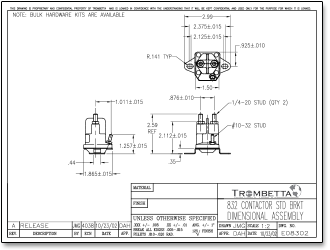 Produced in a variety of sizes and terminal configurations, these contactors are ideal for high volume, cost-sensitive applications. Available with 15% sustained duty, these 12 volt (only) products are ideal for many lawn and garden applications. 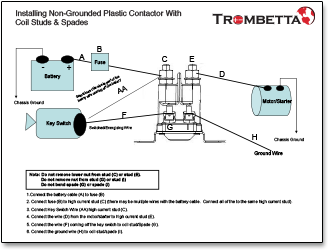 This paragraph is designed to assist you with selecting the correct Plastic DC Contactor for your application by defining each digit in the part number. When you roll over each small box in the image below, a pop-up window will open to explain the feature heading and each of the feature options. For example, a feature heading may be “Sealing” and the relevant feature options may be “No Additional Sealing” and “Resistant to Dust, Liquid”. 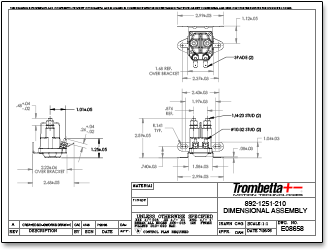 One of our best selling models, the 852-1251-210, would be defined as a (8) Plastic DC Contactor, with a coil connection configuration of (5) one grounded 10-32 stud and spade, and a high current stud of (2) 1/4” stud. 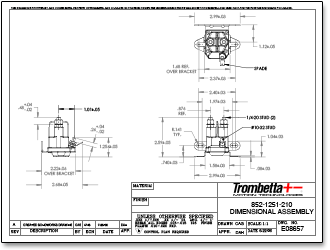 The coil voltage is (12) 12 volts, with a bracket type of (5) universal bracket, and a bracket location of (1) standard location. 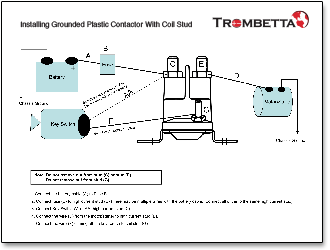 The duty cycle is (2) 15% sustained, the contact material is (1) copper, and the sealing is (0) no additional sealing. 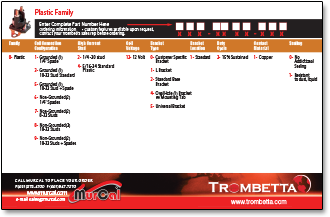 Click here to purchase the Plastic DC Contactor Family in the MurCal web store.